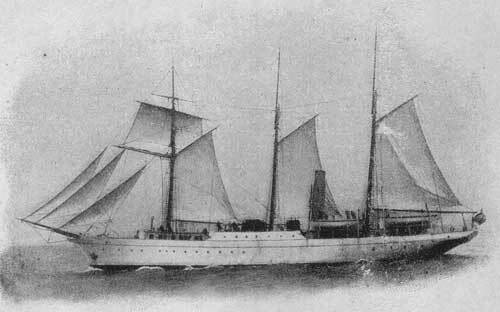 Commander of the Melanesian Mission's steamer "Southern Cross"
Dedicated by the Archbishop of Canterbury, May 23, 1903. THE letter printed in the following pages was written by the commander of the Melanesian Mission's steamer, the "Southern Cross." This ship was built in 1903 by Messrs. Sir W. Armstrong, Whitworth & Co. at Newcastle-on-Tyne. She was launched on the 11th of February in that year; solemnly dedicated by the Archbishop of Canterbury at the East India Dock in the Thames on the 23rd of May, and left England on the 25th. Her commander, Captain W. Sinker, R.N.R., promised to send the writer of these lines an account of the maiden trip to the islands in the S.W. Pacific, amongst which this Mission is working, namely, the New Hebrides, Banks, Torres, Santa Cruz, and Solomon groups. The letter was not written for publication; but it is so interesting an account of missionary work, so freely written, so full of humour and also of enthusiasm, that I have no hesitation in accepting the kind offer of the S.P.C.K. (who contributed £1000 towards the building of the "Southern [vi/vi] Cross") to publish it. For I am certain that the writer will be only too glad if his description of what he saw contributes in any way to the help of the cause of Foreign Missions. I must express most gratefully our indebtedness to Mr. H.J. Ford for his illustrations. Org. Sec. for the Melanesian Mission. The Bishop of St. Albans says:--"I specially desire to commend the letter which was written by Captain Sinker, the commander of the vessel, which seems to me one of the very best testimonies to Foreign Missionary work that I have ever read in my life. Coming from a sailor, the plain simple narrative of a sailor on his first voyage to this Mission, I am certain it will rank with the very best records of Missionary work which are to be found throughout the world. The Bishop of Stepney says:--"Will you please, all of you, obtain, in some form or another, that letter of Captain Sinker's on his voyage among the islands; and will you see that all boys of your acquaintance have it to read? I think they will agree with what was said to me by a young Layman who had just left Oxford, and who had never taken any interest whatever in Missions, 'Well,' he said, after reading this book, 'all I can say is, if all Missionary reports were like that it would be a different thing. I wish to goodness I had seen anything of that sort when I was a kid.' I do ask all persons here present to give their boys this account of Captain Sinker's Island Voyage. It will do more for the cause of Missions than anything else I know." I promised to write you an account of our maiden trip round the islands, so here goes; though, mind you, it is a great business, and whether I shall ever get to the end of it we shall see. On September 17th we left Norfolk Island at 4 p.m. for the islands. Our first place to call at was Vila (Sandwich Island, New Hebrides). I went there to get a little more coal, and also to arrange about having some ready for us on our return south. I hope next year to be able to carry enough coal to last the round trip, but this time, owing to being so full up with stores, cases, etc., I really had no room for any more coal. The coaling arrangements at Vila are primitive to a degree. They only have a small punt, holding 18 tons, and, when we were there, very few natives to work, so it took us nearly three days to get 46 tons. They had to tow the punt out to us some way; we had [7/8] most of our native boys working, but my slight experience of Melanesian boys is that they don't care for too much hard labour, although awfully willing to bear a hand when called upon in the right way; I find you can get them to do anything if you handle them rightly. About noon on September 24th we left for Raga (New Hebrides), where we started paying teachers. This paying teachers is rather a big business; much easier and simpler if they could be paid in money, but in most of the islands that would be impossible, since they would be unable to use it, as there are not any traders from whom they could buy. You will know all about making up the pay--the usual growls when things can't be found; that tired feeling; and so on ad infinitum. Well, we started from the south end of Raga, and worked up the coast. I'll try and give you the names of the places as we came along; I can't vouch for them, however, as of course the charts don't mention many of them. Who invented the names I don't know, but he deserves----. Mr. Edgell was away on sick leave, so Mr. Godden paid his teachers, assisted by J. Palmer, while Mr. O'Ferrall bought yams for the ship. The second place was Ranwadi, where we found a Plymouth Brother had established himself, and one or two of our teachers had left their posts and gone over to him, so we brought their pay back. Then we [8/9] came to Verewerev. (Have you ever heard of these places before? Awful names, aren't they?) There is a small church at this place, built by a labourer returned from Queensland. Steep Cliff Bay was our next place, and here I went ashore, and Mr. Davies came too. Somehow we landed at the wrong place, so Godden took the boat round to the right landing, whilst Davies and I walked over through the bush, escorted by a few dozen natives. It was very hot, and we had a steep cliff to climb. I did not feel quite easy in my own mind whether the natives wanted to eat me or not; you see, it was my first time ashore. As far as possible I drew their attention to Davies, especially when we halted, rather blown with our exertions over the hill. Of course the natives waited for us, and I then drew their attention to Davies, pinching his arm, and saying, "Nice, nice," thereby taking their attention off my own plump body. However, I found afterwards it was a needless precaution as they were all Christians. Of course you have to shake hands with all the natives, and it's very comforting their not understanding English, because you can say exactly what you like; e.g. I shook hands with one man like this, "Hallo! Well, you're the ugliest old man I've ever seen!" to which he smiles, but luckily hasn't the faintest idea what you're talking about. Still, it hits both ways, for they talk [9/10] about you among themselves; often and often I've caught them at it; "Capen," they say, and look at me. I imagine they often think I'm an idiot because I can't talk to them; still it does not really matter, as you can always make them understand anything you want to. Small Harbour, next stop. An idea strikes me: why shouldn't each missionary get big boards stuck up at each village in his district--a black board with the name of the village printed on it, this way: "NAROVAROVA, 11 miles to Opa. Beware of the reef bearing W.S.W, from conical-shaped hill." Stick it up on the shore; it would save me an awful lot of trouble. It's curious no one ever thought of this brilliant idea before. Don't you see, I've only to travel along the coast, look out for the board and see if it is the village I want, and if it is, just steam in. Instead of that one has to stand fairly close to the shore, and annoy every one on board by blowing the steam-whistle to attract the natives on shore. If they are wearing red print "malos" you can pretty well guess you have struck the right place. But it's really very hard to find some of these places, because in nine cases out of ten there's nothing to guide you, the charts being no use for these villages. You have experienced it all, so you will understand. I don't know the name of the next place--nobody seemed to know it--so I called it No. 6 stop. I [10/13] don't quite know what happened there, because I was getting anxious. I wanted to get to an anchorage before dark, and they were taking too long over paying the teachers, at least I thought so. At last, however, we came to the end of that day's work. We arrived at the north end where Edgell has a house. I went ashore, and shook hands with, it seemed, 2000 people. I laughed and smiled as I thought necessary, and looked an idiot I don't doubt. Got a boy to climb a cocoanut tree; wanted to see how they do it. It's really very simple when you know how, and are not too fat! He got to the top and chucked some down. Think I drank the water of three; they are nice when one is thirsty. Look here, I'll never get to the end of this; I ought to have written some each day, but then one really has not the time or inclination, especially in such hot weather. After our Evensong I turned in and had a jolly good sleep, and dreamt I was being chased up a cocoanut tree by three natives! Before I had finished the dream I was roused by a voice, "Quarter to five, sir," and so off we started for another day's work. The first part of this trip was not very interesting because Edgell was away on sick leave, and paying teachers seems to be a business no one likes! From Raga we went to the first point of Maewo [13/14] and from there to Narovarova, thence to Opa, where we landed Godden and all his goods and chattels, amongst them being the material for building a house. Then we dipped our ensign, blew three blasts on the whistle to bid him good-bye, and steamed across to Lakarere, on Maewo. Here all hands went ashore and had a jolly good bathe--you know the watering-place--I bathed in the black pool, in fact most of us did, and it wasn't half bad. We spent Sunday there, so some of the missionaries went up to Tanrig and held Celebration and services. The next day we went on to Merlav, a jolly place, and the people awfully nice. We landed J. Palmer here, with all his stores and a brand-new boat, then proceeded to Mota. We got there at night, so fired a rocket to draw attention, hoping to find Adams on the move, but he had been having fever, and was not about. However, we got him on board and landed Davies, who was to stop there four days whilst we were calling at other places. He was very keen about stopping so as to get some insight into the work. Then to Vureas, where we anchored, and got O'Ferrall's gear and house landed. I went ashore in a native canoe, and jolly nearly capsized several times. I went to try and shoot a pigeon or two for our breakfast next day; but after climbing and tumbling about the best part of three hours, I [14/15] came to the conclusion pigeon-shooting is not what it is cracked up to be. I never saw one, only heard them in the distance. From Vureas we went to Koru, on Gawa Island, and paid teachers. On to Lakona. I went ashore at most of these places, the weather being so fine all the time. I wanted to get some real idea of the work, but I find that when the business is paying teachers you don't really see the work itself. How very neat and simple and clever some of the churches are, and the natives seem so glad to see one. It's amusing how they will insist upon shaking hands; often and often one shakes hands three or four times with the same person, especially children, who dodge behind some one and then come up holding out their hands again. I fancy they have an idea that to shake hands with one of us, or even to touch a missionary, does them good in some way. I love the little black kiddies, they are dear little things. One feels so sorry to see so many of them with such awful sores. I am told all the children have them, and are looked upon as weak till they have had them; so I suppose they get them as we get measles! Just as we got to Koru we saw a boat in the distance, but as it was not lying in our course took little notice of it. I got the telescope to bear on it, but took it for a trader's boat. It turned out [15/16] afterwards to be J. Palmer chasing us. He had left a lot of things on board by mistake, so he had set out from Merlav to catch us; fortunately we had several places to stop at, and he knew where we were bound for. He had been in the boat two nights and a day; pretty plucky of him I thought it. He had eight natives as crew, and they took turn and turn about. I expect J. P. also helped pulling. He used to take his Evensong and Matins just the same in the boat as they were rowing. Fine, that. The sun had caught him pretty well, he was as red as a berry. We took great care of him. From Lakona we went to Black Beach, and I think it was there I went ashore, and Adams baptized about six babies. I enjoyed that. The natives are rather crude in the way they do things at times. The font was by the door at the west end, and they had put a tin basin in the font. I forget now what was wrong with it, perhaps nothing, but the teacher who acts as verger, or what not, took the basin out of the font and slung it out of the door. It amused me because it nearly hit me on the head as it was going out. Most of the babies were pretty good. From here we went to Losolav. Then, as we had J. Palmer on board and he wanted to get back to Merlav, and we were bound for Mota, we gave him a lift to within four miles of Merig, and then said good-bye once more. Got to Mota, and found Davies still alive, only eaten about somewhat by fleas and mosquitoes. I fancy he was glad to get on board again, though he said he had had a ripping time. We put Fox ashore here. He was having a holiday and took it here, being anxious to improve his Mota. Curious way of spending a holiday; still there's no accounting for tastes. We went over to Port Patteson (Vanualava), and anchored there that night. The next day, over to Ara, paying teachers again, then to Metrig and Pek (Vanualava), Rowa, and Dives Bay (Ureparapara). Curious place Dives Bay, crater of a volcano, rather pretty. We anchored at the outside station for the night. I was glad the paying of teachers was nearly over: only Torres to do. All the Solomons had been done the previous voyage. We picked up a man at Mota who had to go back to Torres, and when we got near the Southern Island (Toga) he ran amok. We stopped off the island, and Adams went ashore to pay teachers; and this chap got a piece of iron and rushed around the decks, and then jumped overboard. However, he thought better of it, and before we could lower the boat, had climbed back on board. The boat came back to the ship, and we sent this man ashore; but then we heard that there had been a lot of bad feeling between this island and the next one where this man came from, and that his own [17/18] people might think he was stolen, and fighting might come out of it. So we had to get him back again, which was not an easy job, for as soon as he got ashore he had cut off like a shot. Clement Marau, Adams, and myself, with the boat's crew, went after him; we got him and quieted him down, and took him aboard. He was all right after that, and we went off to Loh. I am not quite sure if that is the proper name, but you will know the place when I describe it--rather a rotten landing all on top of coral, and a bit of a walk to the Vanua; a little church called S. Aidan's. I saw an old box of yours there in the vestry, and thought you'd like to have been there yourself. I was particularly interested in this place because I knew you had made it your headquarters. Everything was nice and clean. We got a lot of yams here, and I bought an old hen; I wondered when we ate if it was an old pal of yours, because it was pretty tough. There had been a bit of trouble at this place; some French labour vessel had come in two or three days before we arrived, and had taken off eleven of their people; whether they had gone willingly, I can't say, but the people were rather put out about it. Then we went to Tëgua, and that finished paying teachers for the trip. I was thankful, for what with the growling in the storeroom, the hot weather, the long time it took some-[18/19]times to fix things off, the tin meat, etc., etc., some of us were getting snappish. We were not really, as a matter of fact, only we were all glad when it was over. It's interesting to notice the different things different groups of islands go in for as regards pay: some are mostly for tobacco, others cloth, or knives, fish-hooks, lines, hats, axes, hatchets, soap, lamps, matches, jew's-harps, pipes, etc., etc. But it varies what things they have--I mean, in Banks Group there will be a run on one thing, in Torres on another, and so on. Now we set off for the Solomons, and made for Pamua, on San Cristoval, where we picked up Mr. Wilson, and then straight to Ulawa to drop Clement Marau and his family and a boy or two. We got there at night. It's an awful place to find in the dark, but I had Hammond with me, and he was invaluable for showing the various landings. I went ashore here, and was delighted to see the fireflies snipping around; and here I also tasted native food. I pretended to like it, and I dare say one would when one got used to it. I saw Clement's church, it is beautiful. From here we went right the other side of San Cristoval, to a place called Cape Jackson. The Bishop had been there before, and the chief had said he would like to have a school there, so we hoped to fix things off. 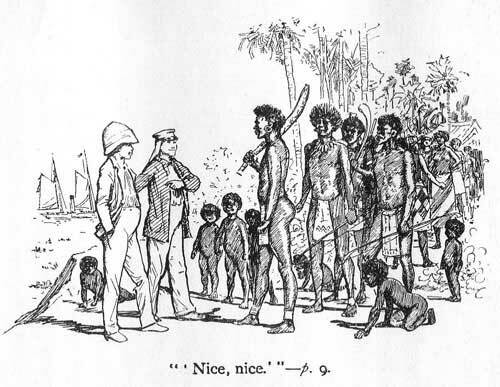 The people were quite heathen, men and women all naked; the chief was a villainous-looking old chap, with [19/20] whom I shook hands, telling him I had not had the pleasure of shaking hands with a cannibal before, and hoped he was all right, to which he smiled. However, the neighbouring chief did not want to depart from his evil ways, and so we could do nothing definite, and after giving the friendly one a few presents we left. I hope next voyage we will get a footing there. About 5 p.m. we started off again to Wango Bay, and thence to Heuru, where we anchored for the night, and landed Mr. Wilson in the morning. I always used to feel quite sorry for the missionaries when we had to land them, because they really must feel so awfully lonely, knowing they won't see us again for such a long time. Of course it's not so bad when we are going north, because we look them up again on the return trip. Still it must be hard watching the ship steaming away from them, with their letters to their relations and friends in England or elsewhere. Still it's a great blessing to feel that they can sometimes hear from the old folks at home, and when we come down again to the islands we bring them the letters from their friends. I think home friends should remember when writing how these letters and newspapers are longed for, and looked forward to for months, and should therefore write long, cheery, interesting letters; papers and magazines, too, are highly appreciated. However, this is a digression, but it just struck me [20/23] because with one of the missionaries we had mislaid his bundle of papers, and hunted high and low for them, and he was in a great state of mind because we could not find them; however, they turned up eventually. After we had landed Wilson we cleared off for Mala, arriving at Roas Bay, where we landed Joseph Wate and his folk We anchored there as we did not want to leave until the evening, so as to steam all night for Sulufou, arriving there at daybreak. I went ashore with Davies, Hammond, and the usual crew to have a bathe, there being a river here; and a very jolly bathe we had, only the stream was very strong and impossible to swim against. The fun came in when we started to row back to the ship. Hammond had the steer-oar, and I was putting on my boots, when an extra big surf came in, and knocked bow and the next boy into the bottom of the boat. I don't quite know where I got--somewhere under Hammond's legs, with my boots floating about in the boat. Hammond was yelling at the top of his voice, "Sua, sua, gaplot!" ("Row, row, quick!") and the boys laughing at those that had got knocked over. H. got angry and still yelled "Sua!" It was a great sport--my first experience of heavy surf, and I found it highly amusing. Poor old Joe Wate! I'm afraid he won't live long. I don't quite know what is the matter--some [23/24] kind of abscess or diseased bone in his face, which seems to be getting worse each day. I am afraid when I get there next year it will be to hear he is dead. Well, he has been a faithful servant, and to think he was on board the "Southern Cross" when Bishop Patteson was murdered, and was one of the boat's crew that went to pick up the body--poor old Joe! His course is nearly run; he has fought the good fight. I liked him. Mrs. Selwyn sent him out a watch. I gave it to him; he was awfully delighted; he held it in his hand, and looked out to sea, saying something to himself, I don't know what. Then his face lighted up, and he looked so happy. I wound it up for him and set it going the right time, and told him the sun all the year round rose at six, and set at six, which, being so near the equator, is near enough for his purposes. We arrived at Sulufou at daylight, and picked up Mr. Hopkins, who came out in a boat to meet us. Poor chap! he was not at all well, and had been having a bad time of it. He had eczema very badly, making it difficult for him to walk He has an awful district too, I think the worst of the lot. You might say he truly carries his life in his hand. He had breakfast on board, and then went off to get a few of his things together. In the meanwhile crowds of canoes came off with yams, curios, birds, fruit, etc. Here the heathen rage, i.e. the majority of villages are heathen. It is where they have [24/25] artificial little islands away from the mainland, so that sometimes on a little island, not much bigger than an ordinary-sized house, you will find 200 people living, and sometimes more. They live there, as you know, to avoid the attacks of the Bush tribes. On the return trip I visited two or three of them with the Bishop, and we found the people delighted to see us. Several chiefs came off to the ship; women never come aboard at heathen places, it is only our own Mission girls that come on board. One chief came off whose attire consisted of a hat, and a battered one at that, a waistcoat, and the usual ornaments, such as nose-rings, bracelets, etc. He saw me making a lemon drink, and signified he would like one. So I made him one, and it was exceedingly funny to see him drink out of a glass--a thing he could never have done before--pouring most of it outside his neck instead of inside. However, he liked it much. It's funny whilst one's having meals to see them squatting around the saloon floor, eating lime and betel-nut; but it's only the chiefs we allow to do that, because, after all, you must recognize black royalty! We landed all Hopkins' stores, and took himself and a few things he wanted on board, and off we went again. This coast is not a nice one for navigation, there being a lot of outstanding reefs, etc. Our next call was Malu; here we had a boy to put ashore. An amusing thing happened here: there [25/26] is no anchorage, and you have to dodge about until the boat returns. One boat went ashore, and we dodged around in the usual way. There were two canoes full of women, who were returning, I presume to their village after gardening, or marketing, as they do, you know, among the different villages. This in some cases is accompanied with a certain amount of danger. I am told the women do the bartering, while the men cover the opposing barterers with obsolete guns, or bows and arrows, each side being afraid the other will steal their women. Cheerful way of doing business! Fancy if one's wife had to go to a shop, and I had to follow her with a rifle, and cover the other man, who would also be covering me, until the business was finished. I shouldn't let my wife do much shopping I think. Well, the ship was steering towards the two canoes, and when they saw we were getting close to them they set up a howl, and fled, literally fled, as I suppose they thought, for their lives, howling at the top of their voices. I suppose their conscience pricked them, and they mistook us for a man-of-war, as indeed we were always mistaken for such all round the islands. However, when I saw they were really frightened I stopped the ship, and let them get well away. It is surprising at what a rate they can travel, all paddling so splendidly together; from a distance it looks just like one person paddling. From Malu we went to Fiu, where we anchored for the night. Here Hopkins went ashore, and I with him for a little while. Most if not all the people here have been to Queensland or Fiji, and can speak "pidgeon English," so I felt quite at home. Everybody was pleased to see us, and we had a smoke and a yarn with them. There was a girl here who, they said, was dying, and we went to see her. (It's so curious: these people, if they make up their minds they are gong to die, just simply lie down and die, refusing to take anything.) However, this girl looked pretty bad, so when I got on board I sent H. some brandy. On our return I inquired after her, and he said she was all right again, and that the brandy had cured her, of which I was glad. We weighed anchor at daybreak, leaving Hopkins to stay here a few days, and went off to Siota, where we expected to pick up the Bishop. We arrived at 8.45 a.m., and dropped anchor. Lindsey Buffet came off in a boat, and told us the Bishop was at Honggo. So we picked up the anchor, and thought we would go through the Ututha Passage. Our new ship was not expected to go through here, the passage being very narrow, with a strong current, and some very sharp bends. However, we put her to it, as it is such a short cut to H; but the tide was too strong, she would not answer her helm quick enough, so we had to give it up, and go round [27/28] the other way. When we did get there, no sign of the Bishop; so I took a boat and pulled to some natives sitting under a tree, and they told me the Bishop had started at daybreak through the Ututha for Siota. So back we went to Siota, and anchored there, but no Bishop. I had had the ship dressed and she was looking quite gay with all the bunting; but by 8 p.m. there was no sign of him, so the flags were hauled down. Soon after we saw his boat coming round the bend in the passage, the Bishop at the steer-oar, and Brown with him. We blew on our whistle and waited dinner for him He was awfully glad to get on board, and I think must have been very hungry. Directly after dinner we had our usual Evensong, and afterwards the Bishop shook hands with the crew, and talked to them a little bit. Then we had our Mota Evensong, and after that sat and yarned, etc. In the morning we took a lot of Dr. Welchman's things that had been left here, and then hove up and proceeded to Belaga, Kobe, Viturua, and Gavutu, where we anchored, and spent Sunday at Halavo. Here I was able to attend a service ashore for the first time. I can't describe how I felt at all. It was all so beautiful, and real. Browne read most of the prayers, and Reuben Bula the lessons, and the Bishop preached. I was greatly struck by the singing, it was really beautiful; the words were strange to me of course, but the tunes were old [28/29] familiar ones. The women sing the best, I think, at most places; perhaps one fancies so because their voices are higher, but what astonishes me is the harmony. I was full of wonder; I had no idea what real hold the Mission has with these people. One never saw any one sitting when they should be kneeling--all most reverent all the time. I don't know what the Bishop's address was about, as it was in Mota, which I can't yet follow quite, though I can make myself understood in it so far as necessary orders go. Reuben interpreted it into Gela. In the afternoon hundreds of the natives visited the ship, and seemed so pleased. They could not contain themselves when they saw the little chapel, giving little grunts of delight. On the Saturday before I had gone to Tulagi to report the ship's arrival in the Solomon Islands, certifying we had no contagious disease, and a clean bill of health from N. I. Commissioner Woodford is in charge here. The Bishop invited him to dinner on Sunday. He came, and spent the night on board, and attended our service; seemed very pleased. Our sailors and firemen turned up in good numbers, and among the hymns we had "All Hail the power of Jesu's Name"; I never heard the men sing so well. I think Davies gave the address. We landed the Commissioner at Tulagi next morning; and proceeded to Halata; picked up a teacher, and then through the Sandfly [29/30] Passage to Ravu. The Bishop went ashore at all these places, dropping boys, and picking up others who were to go to N. I., holding services, dedicating churches, and confirming. Then we went off to Guadalcanar, arriving at Tasimboku at 5.30 p.m. I am a bit hazy about all we did at these places; the Bishop and one of the clergy at least would go ashore at all of them, visiting the schools, and inquiring into matters, confirming and baptizing. We called at Bokokimbo, Lengo, Lunga, Boneke, Savo, and arrived at Maravovo on October 14th. Anchored. Steward and Coates came on board just in time to feed. Coates had been very ill, but was all right again. 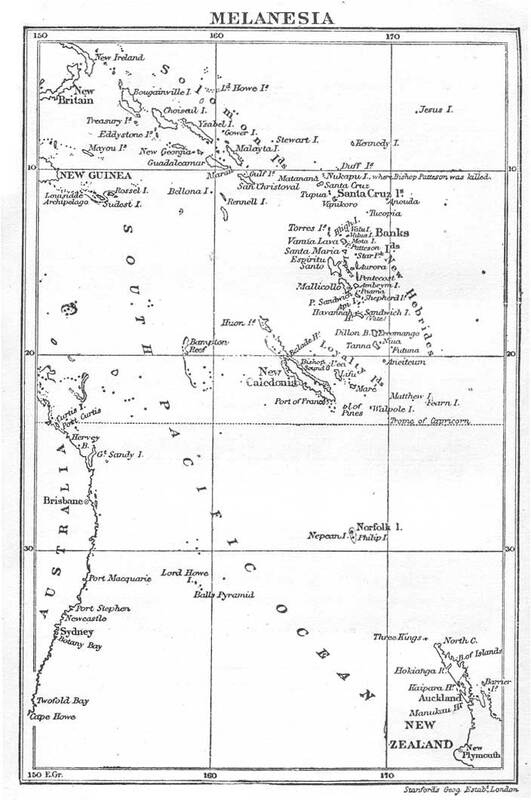 We landed all Steward's stores, took up a boat we were to take to Welchman, and landed Adams, who was to remain here until our return from the Northern Solomons. We went to several places on this island, Pyramid, Wanderer's Bay, Havo, and again to Maravovo. Here, it being a fine, clear, steady day, I took the compass we had aft up to the bridge, and adjusted it, and am glad to say got it correct on all the points. From Maravovo we went to Vulavu; anchored there, and the Bishop went ashore to hold a confirmation. I also went, and was greatly interested. It was all so new and wonderful to me, and I wondered what Bishop Patteson would think if he could see how his death has really been the means [30/33] of the work being carried on with renewed zeal and ardour, and brought to such wonderful results. All the candidates seemed filled with a real eagerness for the Faith, and steadfast and strong to live up to it. I can tell you I have felt more of the real Faith amongst these people than I ever did in our own churches. When one thinks how these missionaries devote the whole of their lives to GOD'S work; and then hears people ridiculing the work they do all over the world, it makes on wish to take such people and show them it requires MEN to carry out our Lord's last message. I don't say that the work in Christian lands is not just as important, but this is a noble calling, requiring tact, energy, perseverance, patience, and to be filled with real love and zeal for the work, or else no one could stand the strain--and a strain indeed it must be, and is. I get positively angry when I hear, as I do constantly hear, people say how much better the heathen are if left alone, and that Christianity makes them thieves, liars, and everything odious. It's a lie, a damnable lie, I can speak what I know about the Melanesian Mission--and I take it all Missions are the same--it raises and elevates the natives; they do not become thieves, or any of the other things people say they do. There are of course black sheep among them, but even these fall to rise again in nearly every case. Can we say as much of own countrymen: "Christian" [33/34] men and women, who have known about Christ and His teaching form their infancy, and yet lie, steal, commit adultery, and other deadly sins: Yet it is such people often who talk about Missions as if they were doing no good. "Come and see." You will find more reverence among these black people then you will in most English churches, and they believe what they are taught. And one cannot but admire the men who take the teaching to them. While we are sitting comfortable in our homes, with all our dear ones around us, these men are battling against all kinds of trouble, far away from home, and friends, and comforts, to carry the message of the Gospel; fighting against wind and weather in their little boats; going from island to island; suffering all kinds of hardships, fever, skin-diseases, which they nearly always get from living amongst the natives. If they do complain, I never heard them, but they have every cause to, I'm sure. But if I go on making these digressions I'll never get any further. From Vulavu we went to Bugotu, where Mr. Welchman joined us. The Bishop consecrated a beautiful large church, and all the natives at this village looked so nice and bright and clean, decked up in their different-coloured print. From here we went to Tanabuli; rather a bad place to get into with the ship--so many reefs around. We were going right round Ysabel, as Welchman had a good deal of work for us to do. [34/35] Anchored, for the night, and next morning to Faro Island, where, it being Saturday evening, we anchored for Sunday. Sundays are a treat to us, as we get a whole day's rest; we never do any ship work on Sundays unless it is absolutely necessary. During the day lots of natives came on board, and enjoyed themselves much. From Faro we went to Kia, which was as far north as we got. It is a very curious entrance with a strong current running. Had I known at the time how very strong the tide was, and the nature of the place, I don't think I would have risked it. We had with us a native who had acted as pilot to H.M.S. "Dart" when she was up here, and talked very fairly decent English. The light was bad for picking up shoals and discoloured water, so I had the second mate up aloft on the look out. Well, we got into the passage, and then, as there was no room to turn round, it was neck or nothing. I think this was the only time I was nervous for the safety of the ship. She would not steer properly because of the tide against us; we had to go full speed ahead to make any way. The black pilot would point out whereabouts a shallow patch ought to be, and the second mate sings from aloft, "It's all green water right across!" Dr. Welchman looked exceedingly thoughtful; Hammond thought it best to preserve silence. I employed my time singing out, "Port," "Starboard," "Steady," etc. No more of that game [35/36] for me except at slack water; why, the tide must have been running eight or nine knots; and no chart--place unsurveyed. Still, nil desperandum; we got through all right. I fancy W. was much relieved; he congratulated us. I refrained from saying all I thought, but made up my mind I would not leave the place except at slack water. We remained at this place, visiting schools, and holding services. Some of us had a little jaunt, pigeon-shooting; the ship snugly anchored out of the tide in a little bay. Hammond, Davies, Brindle, and I started at daybreak, and stalked the pigeons. As far as I remember the bag was fifteen; Hammond eight, Davies two, Brindle one, and self four. As D., B., and I had to share one gun, we did fairly well. We much enjoyed eating them, for it was the first fresh food we had tasted since leaving N. I. At noon that day we left, coming out at the west side; we entered at the east. Now we turned south, and were homeward bound. I know I have forgotten lots of things you would like to have heard about; but my main business this first trip was navigation, bearings, reefs, etc. All those places make up roughly a distance of 2,500 miles. The ship has behaved in a very creditable way; there are things which, had I known the work beforehand, I should have liked different, but as all the contract was signed and the specifications agreed to before I got home, it would have [36/37] been impossible to make a change. Our yards and sails have proved no use on the trip in the islands; I did not have a fair wind more than twice, and that very light; and they offered a great resistance in a head wind. The boats too are too big and heavy. Then it has been necessary to build a new bridge, high enough to see the colour of the water some distance ahead, as you know it is the only guide we have down here at times to tell us how close we are to shallow water. We most certainly should have a winch, because, if she ever gets on a reef, we have absolutely no means of hauling upon an anchor to heave her off; the capstan is no good for that. Still, take her all round, she is a first-rate vessel, well built, and strong, and should stand very many years of work. We burnt about 420 tons of coal, and next voyage, if I can get Westport coal, we should burn about 390, and I hope we shall be able to carry that amount, and not coal anywhere except Auckland. I sent down all the yards while at sea; and we are going to take the mainmast right out, I think, and send the fore and mizzen topmasts and jibboom down, and taper off the lower masts and bowsprit. It is a pity, of course, that these alterations were not made when she was building; but that can't be helped now. After all, every one did their best, and you can't foresee everything. KIA was our "farthest north," and very glad I was to get clear of it. All round there it is unsurveyed, and one needs exceptionally fine clear days for cruising in such places. Two or three times on looking over the side I could see bottom. It gives you a bit of a start, I can tell you, when you're going full speed ahead to suddenly see bottom underneath you. Just about here, however, the water is very clear, and you can see the bottom at fourteen and fifteen fathoms. When I see bottom under the ship, as often happens in these uncharted waters in dull overcast weather when you can't see the difference in the colour of the water, I always stop the ship at once, and take soundings, and enter them on the chart. I suppose one gets accustomed to it in time; but my heart used to go into my throat when we were feeling our way off these patches. The next place was Ortega (Ysabel), a fairly new place, and the doctor was particularly anxious we should stop there, so that the Bishop could speak to the people. You enter a large open kind of bay, with very discoloured water, quite a light green; in fact it looked so shallow I hardly liked going in. However, we found the discoloration was only caused by the fresh water from several streams. We got as close as possible, anchored in [38/39] four fathoms, and the boat started for the beach. We entered a river, and pulled the boat up on one side of it. Each bank was crowded with natives, practically all naked--two different tribes, I suppose; and while the Bishop was talking through an interpreter to the people on one side, those on the other sat down and waited. They had brought a lot of presents for the ship in the way of yams and cocoanuts, and they gave the Bishop one of their Tidalos. They are quite keen for Christianity. I was particularly pleased with the children here, such nice, clean little things, and how they do love shaking hands! I bought a green parrot here, a great ugly brute with a big yellow beak. D. got one too, and in the boat on the way back to the ship he was stroking his, and saying how much tamer it was than mine, when, as if to show him that it does not do to go by appearances, the parrot gave him a good nip on his fingers, which pleased me and all of us very much. D. then gave his parrot to the boatswain. Then we went on to Vulavu, and landed all Dr. Welchman's stores, arriving there about midday, and remaining until midnight. The Bishop was ashore most of the time, talking to the people and so on. Lots of the natives came off to the ship again in the afternoon; it was quite like welcoming old friends, and indeed one noticed at all the [39/40] places we touched at again coming south that they all greeted one quite as an old friend, and were so pleased to see one again. We left here at midnight so as to get to Nagotano early in the morning, as the Bishop had confirmations to hold there. It was 4.30 a.m. when we arrived, and as I was pretty sleepy I did not go ashore, but turned in for an hour or two. We called the Bishop and the others, and off they went in the boat, looking awfully sleepy. The Bishop does not seem to mind what hour he gets up and starts work; this morning it was 4.30. At 7.25 they were all aboard again, and we started off for Maravovo, getting there at ll.30. We had to pick Steward and Adams up here. Left again at 1.30, the Bishop having been ashore had service, and talked to the teachers and people. Off to Savo next, where we landed Steward, who was going to stop in the islands for the summer. 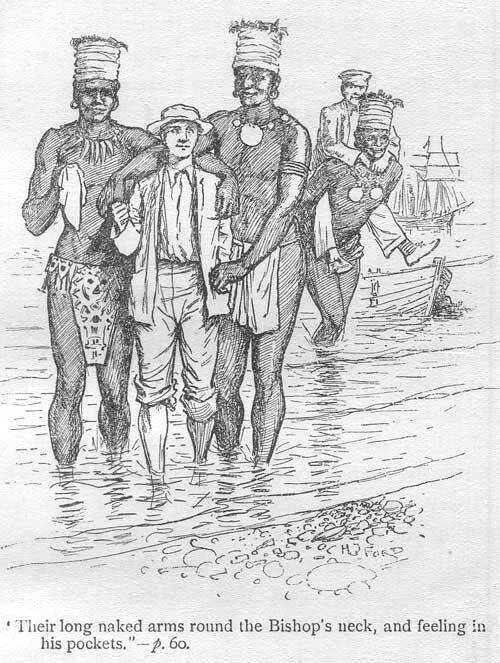 What is curious to me is that these missionaries always seem to be in fairly good humour when we leave them, though they know they are to all intents and purposes out of the world, living amongst the natives, forgotten except by their own relations, and those who are interested in the work To me it seems a splendid, self-sacrificing, noble life. From Savo we steamed to Gavutu, arriving there at 7.30 p.m. I went ashore and made arrangement for taking aboard some coal. The following morning we went alongside a [40/43] wharf (so called) and started coaling, everybody more or less turning to, Bishop included. He superintended the natives filling the baskets, and I and our own men stowing and trimming it on board. By the end of the day, had any one seen the Bishop of Melanesia, he would certainly not have recognized him. 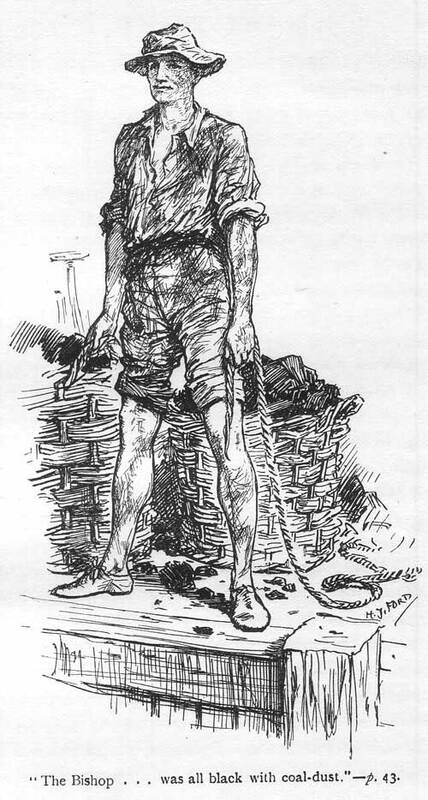 His face was all black with coal-dust, his trousers rolled up to his knees, but very cheerful. When we knocked off at 6 p.m., we were all very glad to tumble into the water just as we were, and have a cooler, so to speak. Coaling there is no fun; you have to wheel the baskets nearly fifty yards, and then lift them on the ship. We took sixty tons on board that day; not bad, considering we did not start till 9 a.m. We finished at noon the following day, and left for Siota. We managed to go through the Ututha this time, striking it at high tide fortunately. It would never be safe in this ship to try it at low water, or at any other time but flood tide, as the current is very strong, and at one place there is only three and a quarter fathoms at high water. Hammond was to be congratulated upon the skilful way he handled her through the passage. By coming through this way we save about twenty-five miles of very foul ground. 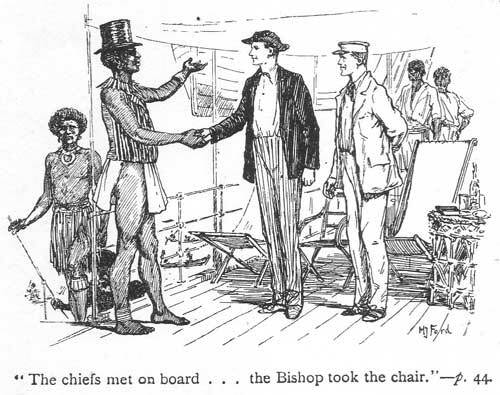 Mr. Woodford was on board again at Gavutu, and had a talk with the Bishop about matters connected with the Solomons. We stayed Sunday at Siota, and services were [43/44] held ashore and afloat, the Bishop going off in the boat to certain villages round about. Browne and L. Buffet came aboard, returning with us to N. I. We left on Monday morning at 1.30 a.m. N.B.--I hope you observe the wicked early hours we used to get under weigh; that was so as to arrive at places at daylight, and make use of the whole day for work ashore. Our next stop was Fiu Bay, 5.50 a.m. Found Hopkins still suffering from eczema, though somewhat better. Usual work carried out here, and off again at 9 a,m. for Malu. We were now picking up boys and girls all the time to take to N. I. On to Nore Fou, and stayed the night, as H. was going to stop there. The people were in a very unsettled state owing to a murder which had been committed, and the Bishop had to see into things. I think this particular place is the wildest of all we went to, and the most dangerous for a white man. Nearly all the natives, both men and women, are absolutely naked. It is the place where they build the artificial islands, 200 people or more living on each island. The Bush people had killed one of these island people, and threatened to kill two more for some reason or other, and were not particular whether they got a white man or not. It was felt hardly the place to leave H., but he specially wished to go on with his work here, and the chiefs promised [44/45] to do all they could to keep the peace; so there he stayed. We had a boat journey of five mile to one of these islets, the Bishop wishing to see a chief who had not put in an appearance at the meeting on board. These places are rather like a pig-sty; the natives all huddled up together, poor things; and yet they seem happy. My old friend the chief, to whom I gave a lemon drink the time before, came aboard again, and wanted another. He was dressed as before--not quite the rig for a meeting at which "the Lord Bishop took the chair"! Swarms of natives came aboard, and were delighted with everything they saw. We did not leave till 5 p.m., after dipping our flag, and three blasts of the whistle to H.
Called at Onepusa, Bulaha, and Puriniola, picking up natives for N. I., holding Celebrations, etc. ; then on to Saa, and from there to Roas Bay. Found Joe Wate again, still alive, and really not much worse, only the wound seemed opening out more, poor old man. We had a big confirmation here--a most impressive service, but an exceedingly hot day. The village is very pretty, and beautifully clean; every one is so happy and bright, quite like one big home. One feels that Christianity has a strong hold. I enjoyed being here very much. Joe seems quite like an old friend, after having brought him all the way from N. I., and seeing him every day. He showed me his [45/46] watch, and asked if it was the right time; he said he set it by the sunset, as I had told him; it was right within a few minutes. From Roas we went to Port Adam, and thence to Ulawa. We did not get there till 9 p.m., and had some difficulty in getting safe anchorage. We went ashore in the morning, about 6 a.m., and were sorry to find Clement laid up with fever, but not too bad to have service at 7. The whole village came, and Clement's son, Martin, played the harmonium for the hymns, and did so very well; a most bright and cheerful service, the natives singing beautifully. Clement wore one of the new stoles Mrs. Selwyn sent him. The Bishop gave an address, Clement interpreting. After leaving Ulawa we went to Lengo, Mataia, Suholu. It is at the last, if I remember right, that they have started to build a large stone church, like the one at Ulawa. They have not got very far with it at present, but the foundations look very solid, and it should be a big church when finished. There is a village near here entirely heathen, but they are gradually coming towards Christianity; they want it badly, but they have held out so long that they don't quite know how to bring themselves to it all at once. The Bishop and I went to their village; it was pouring with rain, and we got wet through in the boat. The Bishop talked to the chief, and tried to persuade him to let us take away a boy to N. I., but he said, "Next time you come perhaps." So [46/47] you see they are not quite ready yet. The Bishop gave them a few presents, and I hope that next trip we shall get a boy or two. From there we went over to Heuru (San Cristoval), and then to Wango, where we had an amusing incident, though it might have been serious. The beach slopes steeply up, and a very heavy surf was breaking on it, and you need to be very careful in handling the boat. We had with us four natives pulling, three going to see friends, the Bishop, Coates, Davies, Adams, and myself at the steer-oar. We told every one as soon as the boat touched the beach to jump out very quickly, and drag the boat up as far as possible. We managed that all right, although I got knocked over when the next surf came, being at the steer-oar, and the crowd having pulled the boat a bit on one side. We pulled the boat right high and dry up this beach, and did the work ashore. We saw an old man here who was a pal of Admiral Gibson's. He had a paper signed by the Admiral when he was there in some man-o'-war at the time the Solomons were declared under the British Protectorate. When we started for the ship again the surf seemed much bigger, and we had to drag the boat such a long way down the beach before we got near the water. However, we watched our chance. Of course you have to be jolly quick over this business. I was shoving at the bow of the boat, and all the rest hauling for all they were worth except A., who knew a thing or [47/48] two; he had hold of the painter high and dry up the beach, and the end of it at that. I don't know what he though he was going to do, but as it happened it was rather a good thing. Well, we got the boat down, when all of a sudden some one called out, "Look out!" We were mostly shoving as hard as we could with our heads down, and when I looked up, all I could see was a huge wave towering above me, just going to break. I don't think I could have got away had I wanted to; however, I didn't, but hung on to the boat like grim death: the oars were placed in the rowlocks all ready to pull directly we got into the boat. I can't quite tell what happened for a few minutes. I just remember some one shouting, "Look out, Skipper dear; run!" then came a tug at the back which knocked one of the oars in the middle of me; I was lifted up, and generally bumped about, and eventually found myself underneath the boat, high and dry on the beach, all the rest of the crowd running for all they were worth, and roaring with laughter at me trying to extricate myself from under the boat. Our next attempt was nearly as bad, the Bishop and I being washed about like corks. The whole thing was very funny. I mention it merely to show the kind of thing missionaries have to go through, because at some of the places they go to the landings are really dangerous, especially where there is coral, and a surf breaking. They not only run the risk of their boats being [48/51] smashed to bits, but themselves also. But after little practice they become first-rate boatmen, and can handle them in any weather. From Wango we went to Faani, and then to Pamua, where we picked up Mr. Wilson again, and left at 5.30 p.m. for Ugi, so that we might spend Sunday there. There is a bit of a fresh-water creek here, so the native boys and crew were able to have a bathe, of which they were glad. Then we went to Parapara, starting at 5 a.m. on Monday; on to Makia, and then to Santa Anna, where Wilson wished to get a footing amongst the people, who are quite heathen, and I fancy not too keen about having a missionary just yet. We had a fair amount of things to land here for W., and after loading up two boats, through some misunderstanding, while we were at tea, the second mate started to take them ashore, knowing we were anxious to get off as quickly as possible. When he got near the village the natives came out with bows and arrows, and yelled at him, and did not look too friendly. So he did not land the boats there. I called him back, and later we went ashore. The natives looked very surly, and all the men who were at the village at the time swarmed round us, and a conversation was carried on by the Bishop, W., and a chief through an interpreter. While this was doing on, D. and I explored. We came across a big shed full of all sorts of things that looked like images. In the centre were large boxes, and we [51/52] could see through the cracks that they were full of human skulls. I told D. that if he stayed there too long they might put his amongst them, so he came away. It appears when they die they put the skulls in these boxes; whether the people are buried first and the skulls dug up again and put here, or whether they eat the bodies and keep the skulls, I can't say. I did not seek information; first, because I could not talk their language, and second, I did not wish to appear too curious lest they should eat me. We left Mr. Wilson here, and I hope he has been able to get a footing at that not too enticing place. It requires nerve and courage to be left in a heathenish place like that. However, he did not seem to mind. I suppose these missionaries so often carry their lives in their hands that they don't think about it. I am glad I wasn't left there. I hope most earnestly when we return to these places to find we have really got a hold of these people, for such perseverance and pluck deserves some little reward; and it's little enough reward these missionaries seem to get here in this life. We left Santa Anna at 6 p.m., and steamed for the Reef Islands, Nukapu being our first stop. I cannot express what I felt as we came up to this place, knowing of the tragedy enacted her over thirty years ago. It is a desolate-looking spot, surrounded by breakers running out several miles; it is with great difficulty that an entrance can be [52/53] found into the lagoon through the surf. We stepped ashore just about the same spot where Bishop Patteson stepped ashore on the day he was murdered. I also went into the hut which stands on the spot where he lay down to rest and was eventually killed. The people were very friendly and kind, but this particular spot seems more distant and isolated than any place on earth. There is a great sense of loneliness about it which one cannot but feel. I am sure the same thoughts were in the minds of all of us as we sat round the memorial cross, standing near the beach. We nearly had another boat mishap getting out of the lagoon, and one that might have been more serious, for it is all coral here, and the surf very big. I was able to keep the boat's head straight, but the native crews are such idiots on these occasions. You no sooner get into a surf than they all stop rowing, or fall over each other trying to get the oar in the water, and miss it and hit the air instead, and then one man seems to knock them all off their seats! You may yell, "Sua--Sua nol! "(Row--row all!) till you are hoarse, but it's not much use. And then one is jammed at the steer-oar with too many people sitting round you. However, we did get through, but it was just touch and go. From there we went to Nufiloli and Matema, and then to Nelua on the main island of the Santa Cruz group. The wind was rather strong while we [53/54] were doing this group, and there was a choppy sea, so the boat work was not too pleasant. The Bishop used to go ashore at all these places, day or night, any hour, any weather. I used to think I had rather a bad time of it, always on the bridge in sun or rain, day or night, but he had a far worse. He would be holding services, confirming, dedicating churches, settling disputes among the natives; at every place there was something to do, and a great part of the time he had fever on him, but still always jolly and bright. From Nelua we went to Timotu. A tremendous rip-tide here, and owing to the wind blowing from the opposite direction to which the current was running, there was a nasty little sea on. However, hundreds of canoes put off to us, but the weather was too much for them, and very few got aboard. Nimbi was the next place, and then we steamed off to Vanikoro, to a place called Palu. This island has not been visited by the Mission for forty years. It's a very awkward harbour to get into, if indeed you can call it a harbour. You can only go by the colour of the water; but we had seen a trader some time before, and he gave us a bearing to go by. We got in all right and anchored, but the place is full of patches and reefs, and wants to be taken gently. While the Bishop was with the natives here I had a bathe; there was an incident. I was with Hammond, and we had two natives in the boat. [54/55] We were told there were crocodiles about, but being a hot day we didn't bother about them, not having seen any. 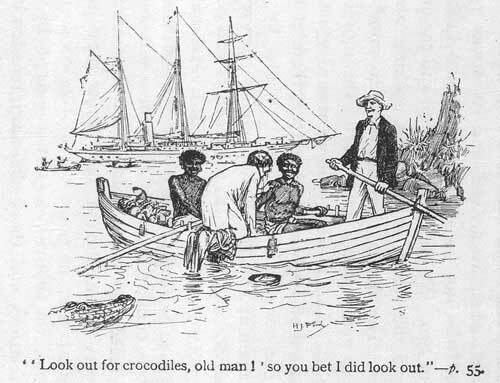 When we had finished our bathe we carried our clothes into the boat, and instead of dressing on the beach, I said I should dress in the boat in case a crocodile came along. So the natives began to pull to the ship. I put my hat on first, and then vest and shirt. Not having dried my legs and feet too well, I found great difficulty in standing up on the seat of the boat to get my leg through the trousers. I fancy Hammond wobbled the boat a bit, and my leg seemed to get stuck in the trousers, anyhow I over-balanced, and fell in. I was roaring with laughter, and got a big mouthful. He says, "Look out for the crocodiles, old man," so you bet I did look out; but H. and the natives shrieked with laughter at me, because when I was in the water I still had those beastly trousers clinging round me. I must here tell you another crocodile story. One night at dinner on board X. told us of an adventure he had had. One evening, after dusk, he was returning to the mission station. He had to pick his way over some rocks, which at high water were just awash, but it was now only half-tide. 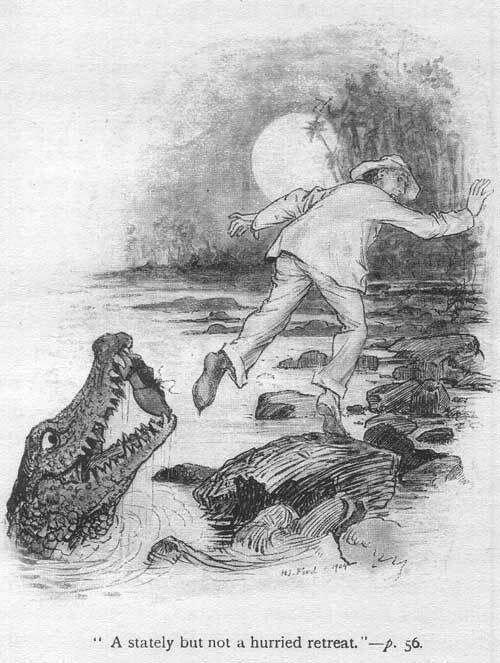 Once he though he was stepping on to a rock, instead of which he put his foot on a crocodile's head. With great presence of mind he withdrew his foot, the crocodile being content with only his shoe, which was size 11. X. thus relieved beat [55/56] a stately, but not a hurried retreat. One can quite picture X. 's stately retreat, when you know him. When he got home he told Y. the experience. Wiser had he told any one but Y., who relating his part of the tale pictured X. 's arrival with a pitiful, frightened, expression. X. however maintained, and still does, that he kept his presence of mind throughout. In the morning X. and Y. went to look for the crocodile, and were surprised and pleased to find X. 's shoe. As the Bishop said at the time X. told the story, the crocodile had graciously returned it, saying, "No, thank you; I take No. 10." Well, there was the shoe, only unfortunately it had no teeth-marks on it. It was suggested, by the Bishop, I fancy, that X. should hammer a few big nails into it, and then draw them out, which would add a measure of vraisemblance to the story. X. remarked that he did not care whether any one believed him or not. That's just as well, as he has not heard the end of it yet! We wanted to go on to another place in Vanikoro, so we started with Hammond up on the topsail yard singing out directions about the reefs and patches. But after going a few miles surrounded by these shallow patches, we got blocked and could not get any further, so we had to crawl back again. I think that time was the worst the "Southern Cross" ever had; we ought never to have ventured it, but the same trader said there was a passage through, and that had done it; [56/59] possibly he might with his boat drawing four or five feet, not so with us drawing about fourteen. It was a great disappointment to the Bishop; personally I was thankful to get the ship safely out. A teacher is going to Vanikoro quite soon, in the course of a month or two from when we left, taking his parents and I believe nearly the whole of his village. He is a splendid fellow, called Ben Teilo. Then we shaped a course for Tikopia. I shall never forget it. The old "S. X." was seldom able to call here through lack of time. The natives are the finest race of men physically that I have ever seen. The men are none of them less than six feet, and the Bishop, who is not a short man, looked quite small beside them, while Adams came about up to their knees! I suppose some of them are well over seven foot six; they have long hair of a yellow colour, and their skin is coppery in shade. They are Polynesians. We could see the island miles away, and as we drew near numbers of canoes came off, and the people on the beach were singing. It all sounded so pretty, and they were glad to see us. There are some Banks Islands teachers working here, and the Bishop had a service ashore; but I don't think much headway has been made there at present, partly because it is so out of the way that the Mission was not often able to spare time to go there. But it is a place we should use every endeavour to get hold of. These folk are [59/60] not cannibals, and seem the happiest people I have seen; moreover, they are not worried by neighbours, having no island nearer than 200 miles away. They have one trait they might dispense with, and that is, they are awful thieves; but they think no wrong of it apparently, for they openly laugh in a most good-natured way when caught. As the boat got near the beach hundreds of them came out to greet us, wading through the water. These great big fellows swarm all around you, and you have one on each side with their arms round your neck, while the other hand is going through you pockets! As I was warned of this I went ashore with nothing in mine but my handkerchief; they got that, however. I was awfully amused to see two even bigger men than usual wading through the water with their long naked arms round the Bishop's neck, and feelings in his pockets. We all shook hands with the chief, and then sat down outside his house on mats, and made him presents of a few fish-hooks and a stick or two of tobacco. Then all these great big men, and some of the women, started chanting and dancing; at least there was not much dancing about it, they stamped their feet all in time, and moved their hands and arms about, constantly keeping up the chant, which was said to be one of welcome. They kept this up on and off all the time we were there. When we went to the boat to return to the ship we had quite a job to get off, a lot of the younger [60/61] Tikopians having gone off in advance and quietly taken possession of it. I call them younger, but they were all over six feet. Then some of the others came, and went for them with clubs, and banged them about not at all lightly, and we got into the boat; but we had still four great big fellows with us, with murderous-looking clubs. I did not know why they were coming off with us, but they seemed to be, so I said nothing. When we got on board I knew why they had come. The ship was literally swarming with those that had come off in canoes; look wherever you would, they were there, and especially up aloft. However, these four fellows, who evidently act as policemen, soon cleared them off. They grabbed in a most unceremonious way the long hair of the victim, dragged him to the gangway, gave him a knock with the club, and shoved him overboard, whereupon he would swim to his canoe. I must try to get some of these fellows to train as sailors; I believe they would just suit us. From Tikopia we went on to Torres again, stopping first at Tëgua, where I persuaded two natives to come with me to Auckland to train as firemen. I hope in time to have only a native crew, but I shall have to do it gradually. There was a lot of work for the Bishop to do at all these places, so that we were not able to get ahead so quickly. The next stop was at Mota, and as there was more work to be done here than at most places, the [61/62] Bishop and Adams were put ashore in the afternoon, and I took the ship across to Pek (Vanualava), and came back for the Bishop in the morning. We did this to save time, as we had two or three boys to pick up at Pek. We were there on the King's birthday, so in the evening I let off two rockets, and the crew sang the National Anthem. After picking up the Bishop, Adams, and Fox, who had been there learning the language, we proceeded to Vureas, where we found O'Ferrall rather seedy, so took him away to N. I. Then on to Lakona, and landed Adams, who remains in the islands for the summer. Then to Losolav and Tarosag, where we picked up J. Palmer, who was to return with us. The next place was Merlav, where we remained some time, as the Bishop had confirmations. We got some yams here, as our supply was getting low, and we had a great number of natives on board. Thence to Lakarere, and so to Opa, where we saw Godden again; called at one or two places, and then to Raga, where we left Godden. That finished the island work. We called at Vila for coal, and reached Norfolk Island on Nov. 18th, about 9.30 p.m. Most of the married men were ashore and off to their homes in no time; and I turned in, feeling that that was the end to all intents and purposes of our maiden trip, and I thanked GOD the ship had come out safely from England, and made her first Island voyage safely, and without losing a rope-yarn, so to speak. Just a few words in conclusion--my own personal opinion of the Mission and the missionaries, after this experience. One cannot speak too highly of the work at the islands, or the splendid training the natives get at Norfolk Island. Only those who have actually been to the islands and seen the work, the hardships, the disappointments, the climate, can form any idea of the life these men lead. You have been there, and know what it is. There is a natural delicacy about saying what the real life is. It is always put in the most glowing terms. Souls converted to Christ is a victory gained, but its costs something. A man given solitary confinement in a prison is less solitary in a way than one of these men in the islands; yet he does it cheerfully, each looking upon Christ's last message as a sacred trust to himself. The climate there is not the beautiful climate the story-books. At certain times it is beautiful, but sometimes it rains continuously for long; the ground gets sodden, vegetation rots, the air gets full of poisonous vapours, breeding fever which lays hold of the missionary, stretching him repeatedly on a bed of sickness. He gets over it for a time, and struggles on with his work, only to be attacked again and again; and still he fights to save a soul. Once fever gets into the system it stays there, and even when a man is on furlough he has it. Then take the case of the Bishop; no one but [63/64] those, I say, who are actually on the spot can form any idea of what he goes through. At home we look upon a bishop as some one almost unapproachable; he certainly has a tremendous responsibility, but his is mostly head work, and his diocese is within reasonable distance. Here the see is reckoned in thousands of miles, scattered, one might say, over the least known part of the globe, away from all communication, with an inadequate staff. He is toiling day and night in a tropical climate, working at times like an ordinary labourer, suffering from sickness, and sometimes in danger of his life. I sometimes get angry when I see money and energy being expended at home on all kinds of useless things and so little on Missions; but being only a sailor I might be told I don't know what I'm talking about, and that I'd better stick to my own business. I have been told that; it generally pleases me! Nevertheless, it is my firm opinion that our Mission deserves all the support and all the help it can possibly get. Richard Clay & Sons, Limited, London and Bungay.